If two sides and the included angle of one triangle are congruent to 2 sides and the included angle of another triangle, then the triangles are congruent. If two angles and the included side of one triangle are congruent to two angles and the included side of a second triangle, then the triangles are congruent. If two angles and a non-included side of one triangle are congruent to two angles and the corresponding non-included side of a second triangle, then the triangles are congruent. 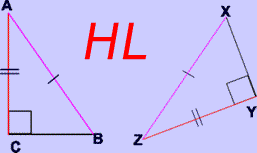 If the hypotenuse and a leg of one right triangle is congruent to the hypotenuse and leg of another right triangle, then the two right triangles are congruent. Once you prove two triangles are congruent by one of the previous 5 postulates, you can use CPCTC to prove any other corresponding parts of those two triangles are congruent.